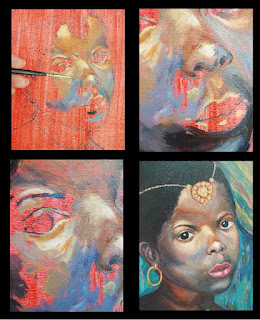 Very dark skin such as African skin, Aborigine or Jamaican skin colours can challenge the artist who normally paints Caucasian skin in portraiture. This is because the colour ratios of pigments shift radically between pale skin and black skin. I took note of the colours I used and the ratios needed to capture the skin colours within a figure in Rossetti’s The Beloved (see picture). I found that extreme contrasts in tone and colours are needed. A diffident approach is not ideal, but an honest more daring approach. The secret of painting a portrait of a black person is to dispel all assumptions about how a black person ‘should’ look and to treat the portrait as the first of its kind. Take an honest look at the colours on the skin and how it shifts from one area to another. When painting The Beloved, I noticed how the colour shifts between brow and chin, from warm browns to cool blues. Rather than paint straight onto a white painting surface, apply a neutral coloured underglaze first. In order to bring out the cool flesh tones, I applied a warm colour, in this case, red, after conducting the sketch. Once I was happy with the sketch and the underglaze, I used the following oil colours for completing the painting: titanium white, burnt sienna, burnt umber, ultramarine, permanent rose, cadmium red and a little carmine red. This is not to discount other useful colours that could be used in African portraiture which might be pthalo blue, cadium yellow (pale) and viridian. I learned from this painting that it is best to apply the palest colours first, which I divided into two: cool pale and warm pale. As can be seen, there is a great difference between the two. The cool colours consisted of ultramarine, permanent rose and a little burnt umber with varying amounts of white. The warm colours consisted of burnt sienna, cadmium red, a little ultramarine and white. I stood back from the painting to ensure the tones made sense with one another. I worked progressively darker, all the time using fine sables which consisted of no.3 and no.6 rounds. Don’t worry about detail at this point, such as the eyes, nostrils and lips; ensure the skin tones between are accurate first. I worked up to these areas, treating the areas between facial features as one single subject matter. The darkest skin tones consisted of burnt umber, ultramarine, permanent rose and a little carmine red. I was careful the colour temperature remained cool around the jawline and chin. With a clean soft sable, I blended the two areas of warm and cool tones, as well as pale and dark tones. I was careful not to pick up unwanted pigments from a neighbouring area, using a fresh sable if I did. It is never too late to make amendments to the skin tones, for instance if one area is too dark or too yellow. Standing back and viewing the portrait as a whole will ensure each tonal area sits against the other in a way that makes sense. My video clip on painting skin colors of various ethnic races. The darkest areas consisted of burnt umber and ultramarine with a little permanent rose, almost to black. Incidentally, I never use black when painting dark skin. I reserve this colour only for the pupils of the eyes, which I will add almost last. Often, the colour of the whites of the eyes will have some relation with the neighbouring skin colour, which consisted of mostly white, a little burnt sienna and ultramarine. A little shadow can be seen beneath the eyelids, which will make the eyes appear to ‘belong’ with the rest of the face. Take extra care over the eyelids, rims and creases beneath the eyes, which often require a little burnt sienna and ultramarine via a no. 1 sable. Don’t be tempted to oversmooth areas of tone, as this will make the face look flat. Describe form of the cheekbones and brow via shifts in tone and hue. This will suggest contours. Only once I was happy with the skin tones between the facial features will I paint in the lips, eyes, eyebrows, nostrils and hair. If feeling tired, now is a good time to take a break and add these features later. The techniques I used for painting skin are simply soft blending with the addition of a little linseed oil to help the paint flow. This portrait shows how even the darkest eyes will possess an element of hue, rather than just black. With a fine sable, I mixed burnt umber and a little ultramarine. It is OK to add a little black to darken the eyes further if necessary. I dabbed neat black for the pupils. Always stand back to ensure the eyes make sense tonally with the rest of the face, or they could appear ‘stuck on.’ This entails adding some shadows and blending around the eye area. The lips consisted of mostly carmine, ultramarine and a little burnt umber for the darkest areas. Take note of the pale highlight above the lips. Lastly, I pasted on the hair colour which consisted of burnt umber, ultramarine and a little carmine red. The ratios of these colours will shift slightly around various points. A little blending around the hairline will ensure the hair does not appear stuck on. As can be seen, painting black skin requires contrasts in tone and hue. I never use flesh tint and black for portraiture but definite hues, which consist of an array of blues, crimsons and warm browns. Even black skin will exhibit pale highlights, but also deep darks. Careful blending between each area of colour will give the painting coherence. I used a selection of fine sable rounds and a little linseed oil for this oil painting. The full demonstration on how to complete this painting can be found in my art instruction book Portrait Painting in Oil: 10 Step by Step Guides now available on Kindle. Troubleshooting guide for portrait painting Why do My Skin Tones Look Lifeless?